In terms of revenue, the global optical brighteners market is projected to expand at a CAGR of 4.9% from 2018 to 2026, according to a new research report titled ‘Optical Brighteners Market – Global Industry Analysis, Value, Share, Growth, Trends, and Forecast, 2018–2026’ published by Transparency Market Research (TMR) In terms of value, the global optical brighteners market is expected to reach US$ 2,036 Mn by 2026. The market is driven by the rise in demand for optical brighteners in detergent products. 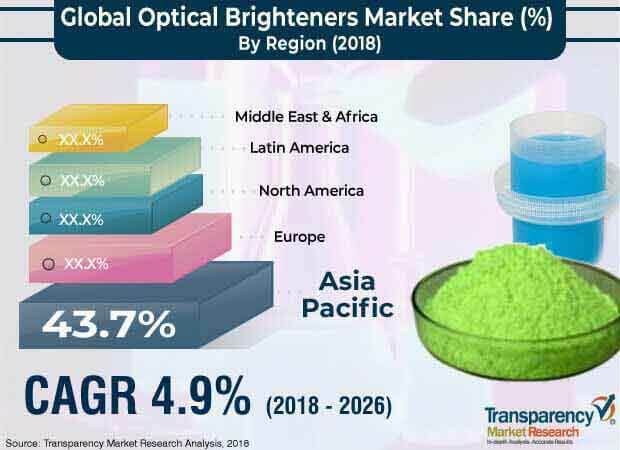 The optical brighteners market in Asia Pacific is estimated to expand at a CAGR of 5.4% during the forecast period, owing to the rapid increase in demand for optical brighteners in the cleaning sector in the region. Based on chemical, the stilbene segment held major share of the global optical brighteners market in 2017. However, the diphenyl pyrazoline segment is anticipated to expand significantly from 2018 to 2026. Based on chemical, the stilbene segment accounted for major share of the global optical brighteners market in terms of value and volume in 2017. Stilbene provides excellent whitening properties in several applications. Optical brighteners absorb lights. This enhances the cloth appearance. The stilbene compound can be combined with other fluorescence agents for improving attractive appeal in the commercial applications. This is projected to boost the optical brighteners market during the forecast period. Stilbene is widely used to manufacture detergents and cleaning powders. Most detergent manufacturers use optical brighteners to enhance product quality and cleaning efficiency. This is projected to propel the demand for optical brighteners. Optical brighteners are chemical compounds obtained from long chemical reactions. The manufacturing process of optical brighteners is carried using specialized technology and machinery. This increase overall investment cost. Pure chemical nature provides high toxicity in case of direct human contact. These factors are anticipated to hamper the market in the near future. Optical brighteners are employed widely in the cosmetics industry due to their excellent whitening properties. Brightening agents are used to reduce dark skin shades and circles in various cosmetic products. Whitening agents play an important role in cosmetic products. Stilbene and diphenyl pyrazoline are primarily used by cosmetic companies to improve product quality. This is projected to fuel the optical brighteners market in the near future. Optical brighteners are widely used for the whitening of pulp and paper products. They enhance their attractiveness by adding fluorescent agents to paper pulp. Rise in demand for paper products across the globe is anticipated to drive the optical brightening market during the forecast period. Asia Pacific was the major region of the global optical brighteners market, accounting for more than 40% share in terms of volume and value in 2017. Growth in urbanization is fueling the demand for optical brighteners in various end-use industries such as textile, paper, detergents, and plastics in emerging economies of Asia Pacific. China is a prominent manufacturer of optical brighteners in the global market. The country has experienced exponential growth in e-commerce in the last two years. This has boosted the demand for detergents and cleaning liquid, thereby fueling the demand for optical brighteners in cleaning applications. Furthermore, advancements in the fashion industry and improvements in lifestyle in emerging economies such as China and India are likely to augment the demand for optical brightening products in Asia Pacific. Increase in infrastructure activities, rise in focus on trade activities, and growth in awareness about hygiene products are anticipated to propel the demand for optical brighteners in India during the forecast period. The report comprises profiles of major companies operating in the global optical brighteners market. The global optical brighteners market is fragmented with the presence of a few small players. Key players include Dayglo Color Corp, BASF Corporation, Huntsman International LLC., Clariant AG, Milliken Chemical, Rudolf Group, Brilliant Group, Inc., Aron Universal Ltd, Archroma Brand & Performance Textile Specialties, Blankophor GmbH & Co. KG, Zhejiang Transfar Foreign Chemical Co., LTD., Paramount Minerals and Chemicals Limited, Eastman Chemical Company, Kolorjet Chemicals Pvt Ltd., and Meghmani Group. Market players have been profiled in terms of attributes such as company overview, financial overview, business strategies, and recent developments. The report also comprises a matrix of comparison between the top four players operating in the global optical brighteners market along with analysis of their key strengths for 2017.